Vandals daubed graffiti on the stand and dugouts. Volunteers at a Borders football club were forced to clean and repaint walls this week after sectarian graffiti was daubed at its ground. Vandals scrawled sectarian and pro-Rangers slogans on dugouts and other facilities at Vale of Leithen’s Victoria Park over the weekend. Graffiti at Vale of Leithen's Victoria Park ground. The Scottish Lowland Football League club’s ground has been hit by numerous acts of vandalism in recent years, but this is the first time there has been a sectarian element to it. A spokesperson for the club said: “We are totally devastated at the vandalism found on the walls of the stand and pavilion, plus the dugouts which, as well as being covered in graffiti, are covered in broken glass. “There is an ongoing problem with relation to vandalism within the stadium, which is not helped by easy accessibility due to lack of a perimeter fencing. “Last season, we put expensive roofing material on the dugouts, and this has also been damaged. Members of the committee removed the graffiti and repainted areas affected on Monday, and now they are hoping that the culprits will be caught. 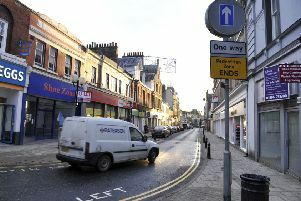 Vice-chairman Bobby Craigie said: “We found out that other places in the town have been targeted by the same vandals. Hopefully, that means that the club were not targeted for sectarian reasons, just idiots with nothing better to do. Nil By Mouth, a charity which seeks to challenge sectarianism in Scotland, has contacted the club and is set to sponsor Vale’s home game against BSC Glasgow on Saturday, March 9. Police are appealing for anyone able to help them identify the culprits to call them on 101, quoting incident number 0943 of February 4. A spokesperson for Police Scotland said: “Police in the Borders are investigating following a report of vandalism at a football club in Innerleithen. “The incident took place between 9am on Friday, February 1, and 9am on Monday, February 4, in Victoria Park. “Inquiries are ongoing, and anyone who witnessed any suspicious behaviour in the area over the weekend of February 2 and 3, or has information that can help identify those involved, is asked to contact officers on 101 and quote incident number 0943 of February 4.